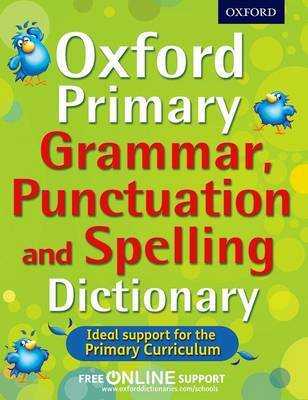 The Oxford Primary Grammar, Punctuation, and Spelling Dictionary is the essential reference book for the test in May 2013. In full colour, it has easy-to-use rules and help, plus an alphabetical list of the tricky, and everyday, words including those most commonly misspelt, all b... read full description below. With a clear, colour layout and quirky bird character to make it fun to use, the book is in two parts. The first part is a reference section of simple rules, tips, and examples to improve literacy skills for the test at the end of primary school. This divides into three sections - Grammar, Punctuation, and Spelling. The second part is an easy-to-use alphabetical word list of common tricky words, with inflections, but no meanings. This list highlights, using analysis from the Oxford Children's Corpus, words that are most frequently misspelt by this age group, to target and rectify these common mistakes. There are helpful tips to guide the user around the alphabetical list to the word they are looking for, and notes at key words to aid correct spellings. It will be a valuable resource for preparation for the new KS2 Grammar, Punctuation and Spelling Test coming in May 2013. Online spelling lists, punctuation, and grammar activities will be provided for easy practice at home or as part of lesson starters or as homework.